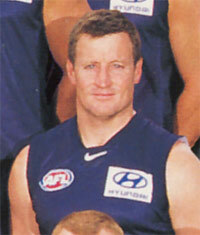 Another great from Western Australia, John Worsfold served as an assistant coach at Carlton during seasons 2000 and 2001 – the period of transition from David Parkin to Wayne Brittain as senior coach. Fondly known as “Woosha” throughout his football career, Worsfold was an outstanding junior at South Fremantle before he was recruited by the West Coast Eagles on their formation in 1986. He made his AFL debut against Carlton in round 4, 1987 at Princes Park, and soon settled into a role across half-back, where he blossomed into one of the games’ best defenders. After winning the Eagles’ Best and Fairest in 1988, he was appointed captain of the club in 1991 - a position he would hold for eight seasons. During that time, West Coast won AFL Premierships in 1992 and 1994, whilst Worsfold also captained WA in two of his five State of Origin matches for his state. “Woosha” retired after the 1998 season, having played 209 senior games, and spent the following twelve months as a media commentator. Then late in 1999, he let it be known that he was interested in coaching, and that led to approaches from a number of clubs including Geelong, Hawthorn and Carlton. Eventually, after being overlooked for the senior coaching position at Hawthorn, Worsfold accepted the role of assistant coach at Carlton, on a three-year contract. However, late in 2001, West Coast abruptly sacked their coach Ken Judge, and offered the position to Worsfold – provided that Carlton would release him from the final year of his contract. As usual in these situations, the Blues did not stand in his way. Worsfold returned home and coached the Eagles for the next 11 seasons, including the 2006 Premiership. Contributors to this page: PatsFitztrick , Bombasheldon , true_blue24 and Jarusa . Page last modified on Tuesday 25 of March, 2014 10:44:28 AEDT by PatsFitztrick. 1987 - Dipper; Future Blue Stars - Aitken, Gallagher & Phillips (26/08/87).